The education plan outlined by Gretchen Whitmer, Get It Done: Better Schools Now for Michigan Students, is built around four themes. To view the full plan, visit gretchenwhitmer.com/education. Her plan will end the “hyperfocus” on standardized testing pushed by DeVos and her allies and encourage schools to focus on project-based learning and other approaches to build creativity and problem-solving skills that will take students into a career. 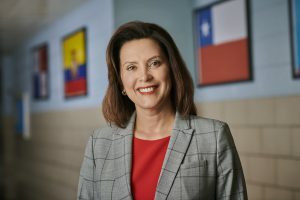 Whitmer’s comprehensive blueprint would move Michigan toward universal preschool for four-year-olds, develop wrap-around services in schools through community partnerships, and triple the number of literacy coaches in schools—focusing on support instead of punitive measures such as third grade retention. “Right now the philosophy at the Capitol seems to be there’s no constitutional right to literacy—that’s what our attorney general and governor say in court,” she said, referring to Republican gubernatorial candidate Bill Schuette’s response to a lawsuit arguing the state has failed its neediest students. “I believe every child has a birthright to a solid education,” Whitmer said. Months before unveiling her plan, Whitmer sought input and ideas from educators. As governor, she will continue that approach with a Governor’s Educator Advisory Commission of frontline school employees to advise on pending laws and assist in implementing needed reforms. Whitmer also vowed to improve pay for educators who have endured several years of falling and stagnant wages. “It’s time for us to respect our educators,” she said. “If you have dedicated your life to the education of our kids, and gone through the training it takes to get the degree, then you should be treated like the professional and critical person that you are. MEA President Paula Herbart said Whitmer is following through on her promise to listen to and address the concerns of educators and support staff. “Three clear themes emerged from the input we received from about 1,000 members across the state—and all three are addressed directly in Gretchen’s plan,” Herbart said. Those three themes included respect for educators; reducing over-emphasis on standardized tests; and fixing our broken school funding system. Whitmer’s plan shifts to a weighted funding formula based on the fact that different students have different needs, which in turn have different costs to educate. At the same time, she plans to stop lawmakers from taking hundreds of millions of dollars away from the School Aid Fund to cover other parts of the budget. She will also push for strong transparency and accountability measures for all schools, including for-profit-operated charter schools and their management companies, and she would stop expansion of for-profit charter schools. From greater respect for the profession to ensuring schools foster the workforce of the 21st Century, “This plan addresses so many needs we hear from front-line educators,” MEA’s Herbart said.